BarCamps continued the positive start of the new season with a string of marvelous editions that comprised of a set of interesting speeches and intriguing stories for the audience. The already-established community consisting of zealous people, who seek to innovate and develop themselves both in academic and professional terms, and powerful talks made this edition just as exciting as the preceding ones. Compared to the latter, the BarCamp Marathon, held in Prizren, Gjilan, and Prishtina, as well as the Open Data Meet-Up Gjakova event were co-organized by IPKO Foundation and UNDP Kosovo. The main theme of these four editions of BarCamp Marathon was Open Data, which refers to the idea of making data easily accessible and available to everyone to use and republish as they wish, without restrictions from copyright, patents or other mechanisms of control. Having data open for public is beneficial in many ways as people can reuse such information to further develop results. Furthermore, open data discloses and removes potential biases that might exist within society. Thus, offering open data discussions to the community brings beneficial outcomes. In BarCamp Prizren, three speakers were invited, pertaining to Fidan Kalaja from Levizja Fol, Jeton Mehmeti from the Institute for Advanced Studies GAP, and Georges Labrèche from Open Data Kosovo, while a workshop on parsing PDFs for data, HTML parsing, and downloading websites was held by Thomas Levine, a data hacker and scientist. Fidan focused on the importance of Open Government Partnership (OGP), while Jeton put an emphasis on the benefits of opening the detailed data on the country’s budget expenditures. In BarCamp Gjilan, in addition to Georges’ and Fidan’s speeches and Thomas’ workshop, Gezime Idrizi offered her insight on what the Municipality of Gjilan is doing to open data to its citizens. The Open Data Meet-Up Gjakova consisted of speeches from George and Fidan, while the Mayor of the Municipality of Gjakova, Mimoza Kusari-Lila, discussed the process of opening data within the municipality, the challenges it is going through, and the importance of turning this into successful outcomes. In BarCamp Prishtina, we invited three speakers consisting of Dardan Sejdiu, Agron Demi, and Georges Labrèche, while a workshop on Open Data was held by Thomas Levine. All of them provided their insights on the way open data are used and what each one of them does to promote open data in Kosovo. 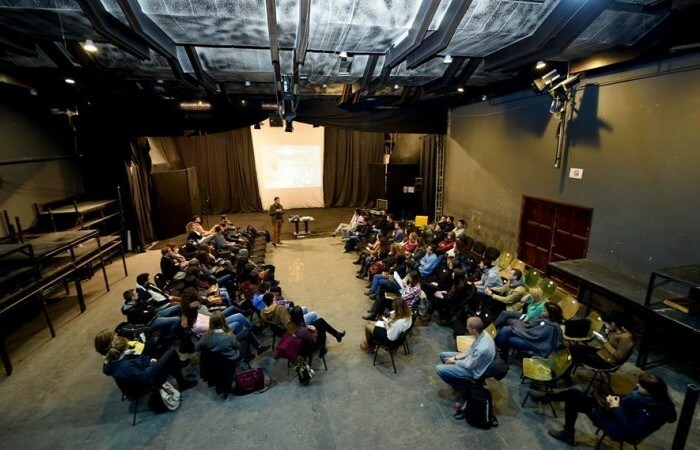 This edition of BarCamp Prishtina took place at the Oda Theatre, an area that provides a decent environment in which people can gather, socialize, share ideas, and prosper. Powerful talks engaged the participants’ minds, while fresh cold drinks kept the former receptive to thrilling discussions. Dardan Sejdiu, currently the Deputy Mayor of the Municipality of Prishtina, as well as the Director of Economy and Local Development, was the first speaker of this edition. Being a competent individual in the field of Economics, Dardan talked about the different approaches that the Municipality of Prishtina is currently undertaking towards opening data and offering its citizens access to various kinds of information. He also provided his insight on the initiatives that are being implemented in an attempt to digitalize the capital city. Agron Demi, the Executive Director of the Institute for Advanced Studies GAP, discussed how GAP is trying to use the advantages offered by the modern era of Information Technology in order to increase citizen participation in decision-making, accountability of decision makers, as well as the interactivity of citizens. GAP has created the largest electronic platform data for budget expenditures and revenues for multiple organizations in Kosovo. Agron focused on the importance of having access to detailed data of the country’s budget expenditures, as a tool for fighting corruption, mismanagement of public money, and enhancing the correction of public officials’ behavior towards public property. Georges Labrèche, engineer and co-founder of Open Data Kosovo, focused on what the latter does in terms of data processing, so that relevant data make sense to the public. He is actively working to increase the use of digital technology to promote good governance, transparency and accountability in governance. Georges discussed a number of benefits that come from public disclosure of data in an effort to build capacity through digitizing. Raw data can be largely inefficient; thus, Georges put an emphasis on the importance of having active digital actors, who can process these data and transform them into information that are accessible and understandable for everyone. Therefore, the role of the digital community in achieving this goal is essential towards enriching the digital local capacity. Thomas Levine, data hacker and scientist, offered the participants a chance of learning beneficial techniques through his workshop held at Innovation Centre Kosovo. Since much of the world’s data are stored in portable document format (PDF) files, data scientists, including Thomas, see this way of storing data as vastly inefficient. This is due to the fact that such files often need to be converted into databases, graphs, or spreadsheets. Tom’s workshop taught interested participants how to parse PDFs for data, while also touching on HTML parsing and downloading websites. Cheers to another marvelous edition!